How many times have you done shopping for shoes? of course many times. And when there is an amazing deal or sale we all just cannot control our excitement. But there are times when we pick the wrong size of our shoe, whether offline or online. And if the shoe that you bought is a size smaller, then be ready to bear the pain all day long while walking. But from now you won’t have to worry, as, in this article, we will be telling you some easy and amazing ways to stretch your shoes. Here have a look! As we have studied earlier from science that heat causes things to expand, this concept also applies to stretch your shoes. Shoes also get expand and the material loosens up. Always remember to use the heat treatment on leather shoes only. Other fabrics might not tolerate heat and the shoes may get destroyed. Put a pair of thick socks. The tighter your shoes, the thicker your socks should be. Now put on your tight shoes. 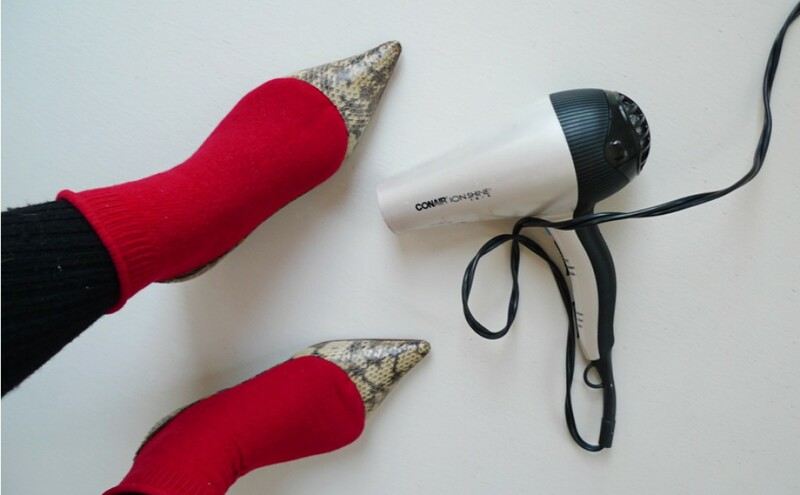 With the help of a hairdryer, heat up your stress shoes. Focus the heat of the dryer at the tighter section of your shoes. Keep blowing the hot air for a couple of minutes. Don’t ever keep your feet stable, keep flexing them. Switch off the dryer and wear the shoes until the leather cools off. Take off the shoes and try the shoes now. You will find it comfortable to get in. Want to stretch your shoes more loosened? Keep doing the heat treatment. This is the second step to break the tightening of the shoes. 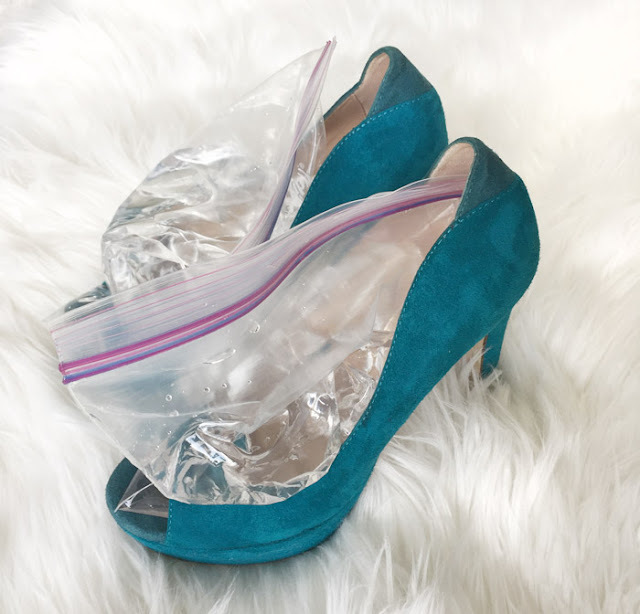 You just need the ziplock bag of water, freeze it and put it in the shoes. This will let the water to get expand as it gets freezes and stretches your shoes creating space between your toes and foot soles. 2 Large zip lock bags. 1. Firstly fill all the ziplock bags with enough water so that it can fill up with the toe cap of the shoe. 2. Prepare a bag for each shoe. 3. Seal the bags by squeezing out its air. 4. Now put the water filled bags inside the bags. 5. Place the shoes in the freezer for 4-8 hours. The main idea is to freeze the water. 6. Once the water has become ice, remove the bags from the shoes and put on your feet to check the fit. 7. Repeat the procedure, if you feel you are still not comfortable in that size. The stretch sprays are easily available online but why to spend money when stretching of shoes can be done in a simple and inexpensive way. Yes, you can do it with the help of rubbing alcohol. This is one thing that can be used to clean other stuffs as well. A pair of tight shoes. Pour some rubbing alcohol into the spray bottle. This technique is easy and simple enough to spray it on your shoes. Now the most important step, spray the rubbing alcohol on the tight areas of your shoes. Put on these tight shoes and immediately start to walk around. Rubbing alcohol dries very fast and you need to be quick in wearing as it works only when the shoes are wet. Suppose if your shoes are all tight around. Then soak a pair of socks in rubbing alcohol and wear them immediately and put your feet in tight shoes. Keep walking in those shoes until the rubbing alcohol completely evaporates from the socks. You will feel the shoes stretching out better thereby making you walking more comfortably and easy. So, these were some easy and amazing ways to stretch your shoes.